The action takes place in Burma. Thiri, who dreams of becoming a writer, falls in love with a European traveller. Momo thinks he can read the mind of a mysterious Western hermit who looks like Christ. Ada, because she is in love with a monk, is ready to become a nun. Through the intertwined paths of those three female characters, this movie depicts the reality of Burma now, an Asian country undergoing major changes and facing the Western world. Was there something specific that inspired you at the beginning to make this movie ? I was struck by the place of spirituality in the Burmese people's way of life. Buddhism is the State religion there, and it is practised by the vast majority of the people. But because of ethnic diversity, Islam and Christianity are also present . The starting point of the movie was to write a script exclusively from the Burmese female perspective. It's a fictional perspective of course, since I'm French, but the script is also ethnological. The goal for me was to detach myself from my European identity and adopt the mindset of another culture. The title of the movie « A WORLD FAR AWAY » doesn't refer to Burma as seen from a Western perspective, but on the opposite refers to Europe as seen by Asian women. Why do the Western characters remain silent ? Only the Burmese speak in that movie because I take a totally Burmese perspective. Everything happens on a subconscious level, without using words, like in a dream. All the characters are doing some deep soul-searching. They live in a kind of parallel world, between sleep and wakefulness, in a daydream. The Western viewer can feel like he is witnessing a dreamlike experience. But from the Burmese point of view, this condition has a name : it's called meditation. It's a daily practice known by all Burmese people. And the rule number one of this practice is to refrain from speaking, to put all your habits aside and focus on your breathing. But why decide to make those Europeans, of whom we should feel close, so mysterious ? 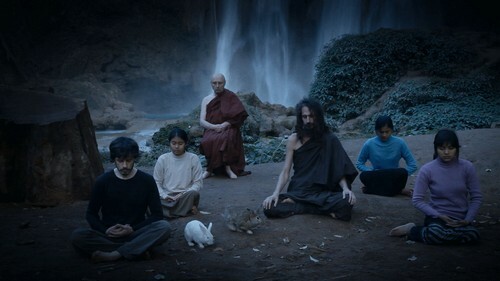 If I only wanted to make a movie that was going to be an introduction to the Burmese culture, I would have for sure invited the viewer to identify with one of the European characters. But it wasn't my goal .I wanted to bring the Western viewer to question himself by exploring a foreign territory. All the movie is based on the visible signs of behaviors and their interpretation. But nothing is for certain. Any perception can be questioned at any given time. Enigmas are presented, temporary solutions are given but then the plot thickens. Even if you reject all religious beliefs, it's hard to deny that we are all inhabited by a mystery. In that movie, I wanted to develop the idea that every human being is an enigma, for others but also for himself. We think we know our neighbors and those close to us, but do we really know them and do they really know themselves? If we sincerely ask ourselves that, we must question the concept of what a person is and therefore the idea of a narrative based on the evolution of relationships between the characters. For me, the most important thing in human relationships is not based on words. The most important part of communication for me takes place in an invisible interaction between people's subconscious. And the subconscious, which is still a mysterious territory, stimulates what for me seems to be even more important in our lives : the imagination. Should we have more empathy for your Burmese characters than for your Westerns ones ? Most Burmese people believe in ghosts and in incarnations of even more incredible beings. I am aware that this is difficult for the Western viewer. But it is one of the challenges of the movie: to get close to what is unknown to the Western viewer, the inner life of the Burmese characters when faced with uprooted Europeans who turn out to be even more enigmatic than the inhabitants of a mysterious country. For our Burmese heroes, those Westerners, as foreign as aliens coming from another planet, looking so unreal that they seem like ghosts, trigger and stimulate their imagination. But those Westerners are very real. They are like lost children, thrown into an unknown world. In alien mode they don't recognize themselves, and for me they represent the latent depressive state of today's European society.